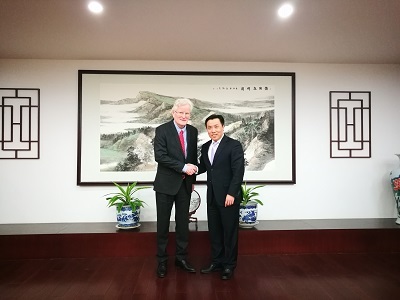 On March 19th, Chinese Ambassador to Iceland Jin Zhijian met with Gudni A. Johannesson, Director General of National Energy Authority of Iceland. They had a friendly conversation on strengthening cooperation in energy field between the two countries. Jin expressed his appreciation of and thanks to the Authority’s long term effort to promote geothermal energy cooperation between China and Iceland, and has trained nearly 90 Chinese geothermal technical staff. Jin also pointed that the cooperation in geothermal field had been a bright spot in Sino-Icelandic relations with features such as long history, broad range and good result. We could believe that with the transformation of China’s economy and implementation of strategies on environmental friendly, green and sustainable development, more opportunities and promising prospect will emerge for cooperation in the geothermal field between the two sides. Johannessen recalled happily the nice experiences during his visits to China. He expressed his admiration for China’s profound development achievements, believing that the huge changes and future potentials of China’s development will bring about new opportunities for Iceland. The Authority is wiling to keep close contact with the Embassy, so as to work together to further promote development of bilateral cooperation.